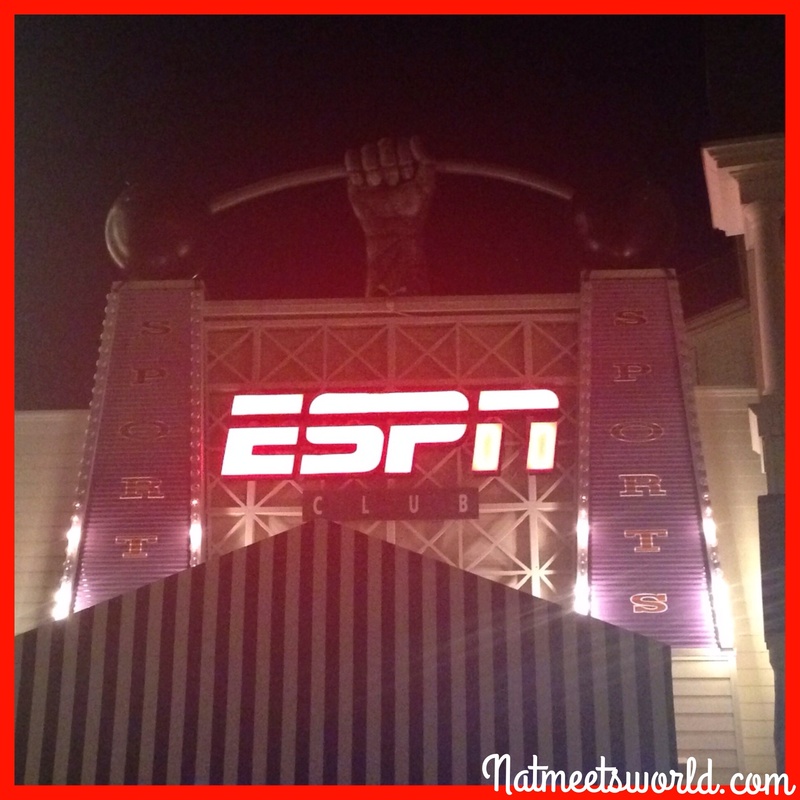 If you plan to visit the Boardwalk at the Walt Disney World resort, you have to check out the ESPN Club Restaurant. 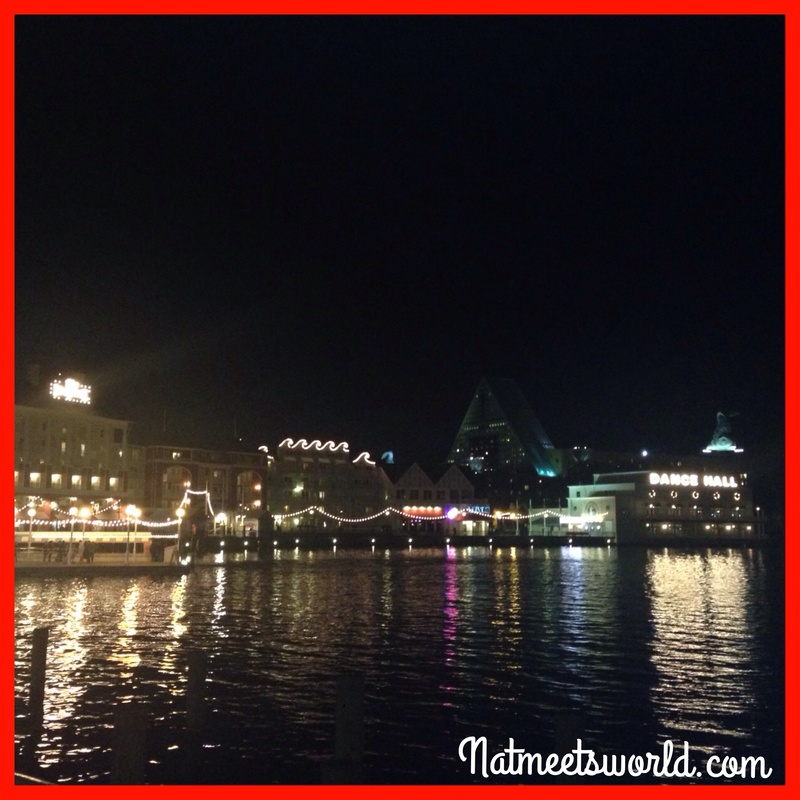 It has been newly renovated, and I have to say, while I have always enjoyed dining in this casual restaurant, the renovation has made it come to life with live shows that are held directly from the restaurant! 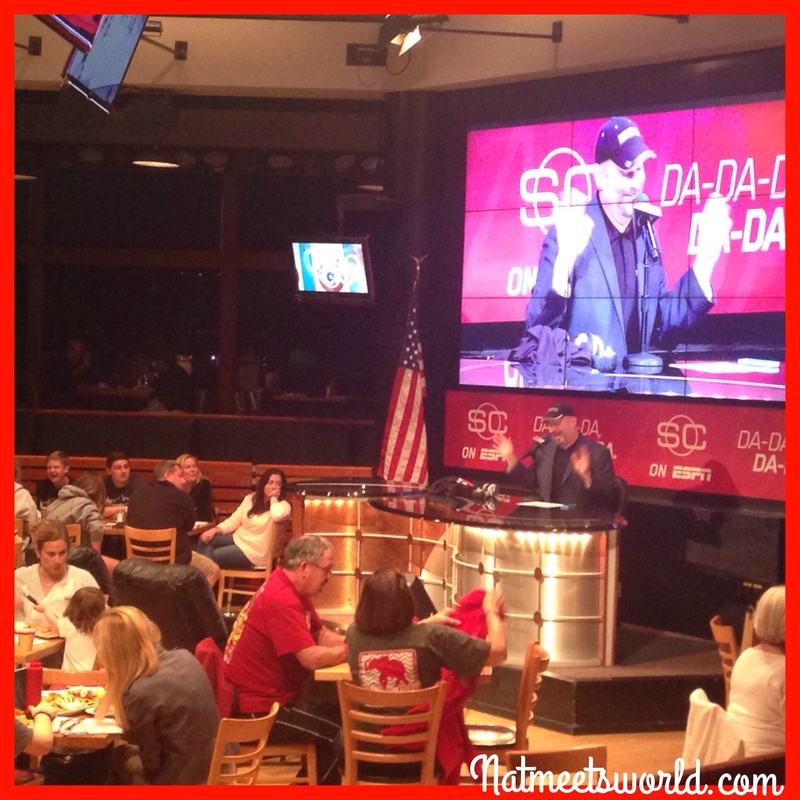 As soon as I entered the restaurant, I felt like I was live on the ESPN network. The crowds were cheering and chit-chatting like there was no tomorrow. It was very busy, and there was a lot of movement. The bright colors and flashing lights from the televisions and pod-casts that surround the restaurant walls are inviting and will put a smile on your face as soon as you enter. 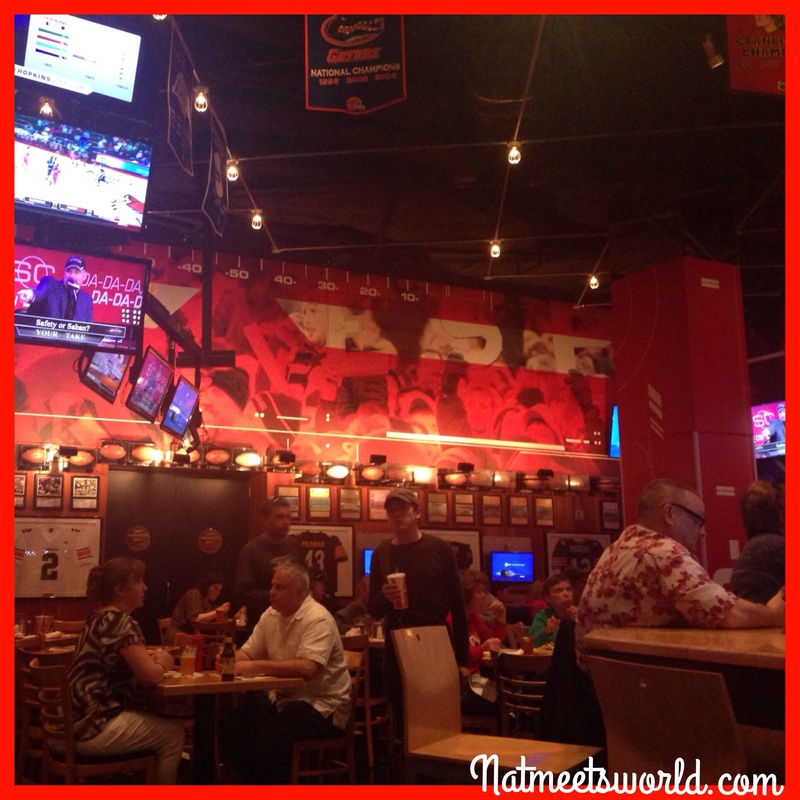 The restaurant has several spacious seating areas along with a square shaped bar. The walls are covered with sports memorabilia from many years ago until present. I enjoyed looking at all of the autographed jerseys and balls used in games, but my favorite was the authentic seats from Fenway Park. I thought that was a very clever and unique idea. A lot of effort was put into making sure there were several sports represented through well known items (i.e.- the ‘Terrible Towel’ that the Pittsburgh Steelers are known for were evident at the entrance). Here is one of the rooms for dining. This is the bar area located near the entrance of the restaurant. This area is first come, first serve. I also couldn’t help but notice that there was a gentleman with a larger than life camera on his shoulder, filming what seemed to be an ESPN announcer right next to my table. I immediately realized they were doing a live podcast! One of the main newly renovated rooms includes several tables for dining, however, in the very middle is a huge announcement desk where the pod-casts are filmed. The pod-casts includes the audience in interactive sessions which is really cool (so that you can have your 15 seconds of fame)! 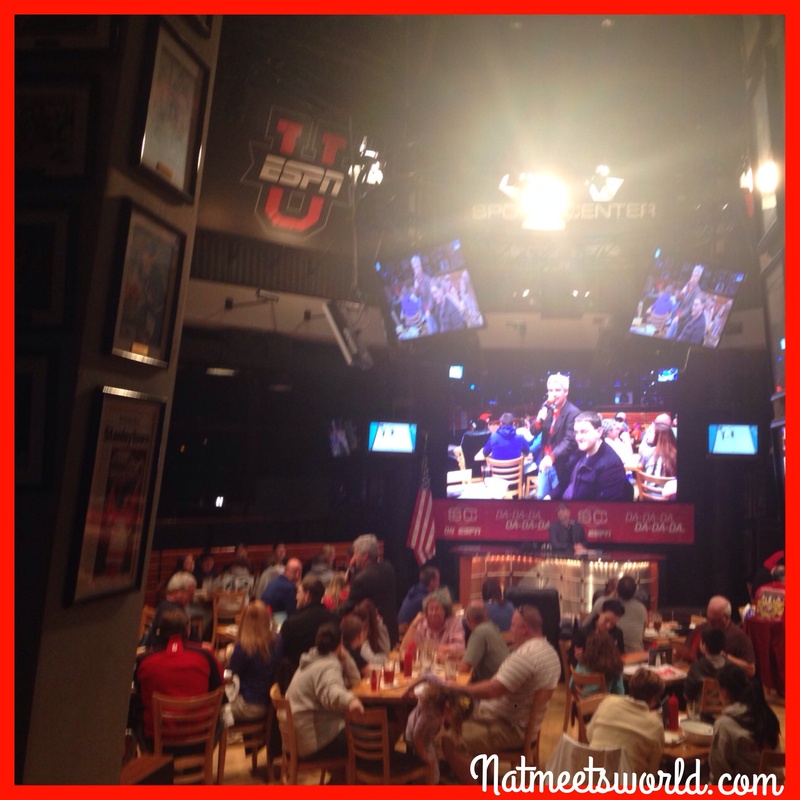 I was ecstatic when I saw myself on TV on the giant screens that surround the restaurant. The pod-cast that was being held included trivia (which is right up my alley being that I am always playing trivia games at parties and on my phone). 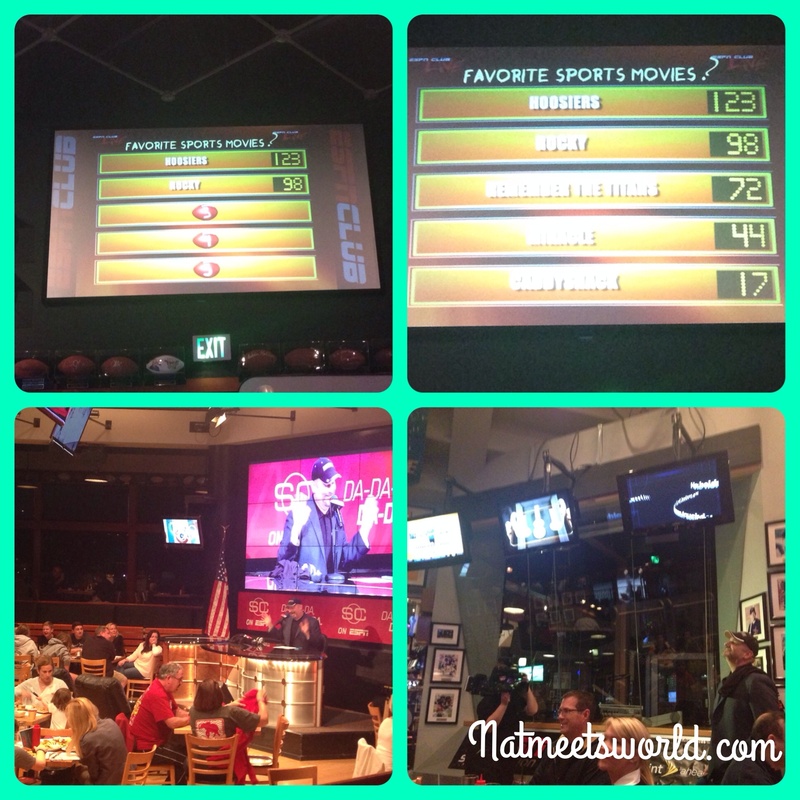 We played a Family Feud type game where we were asked to name the top 5 sports movies ever made. The announcer made his way around the restaurant getting different answers from guests. It was great seeing everyone get into the game. 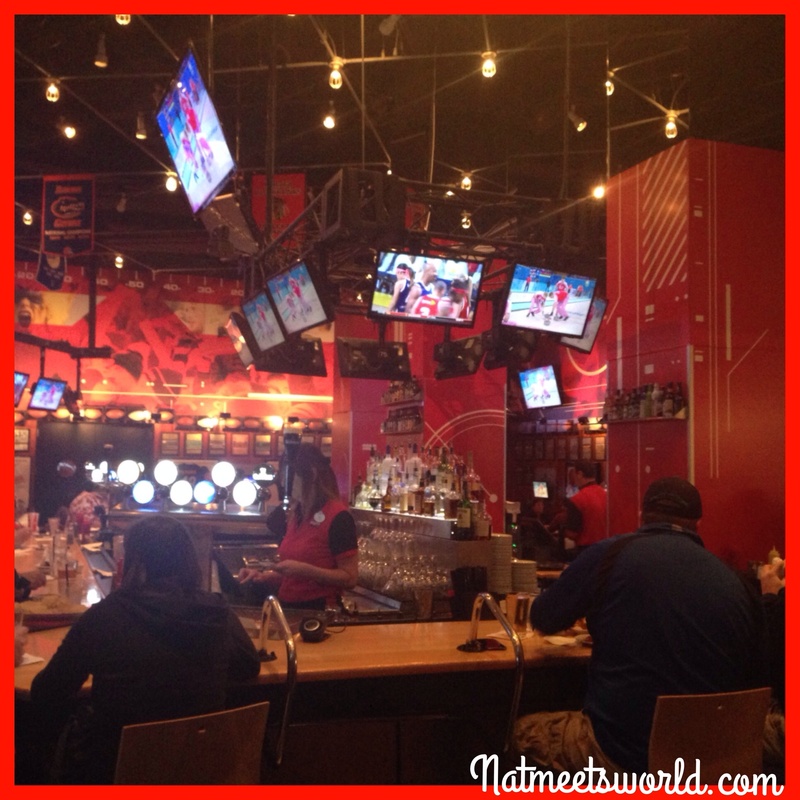 This is a great place to hang out with friends, family, and of course, outgoing sports lovers. This is the main (and newly renovated) dining area where the live pod-casts are held. As you can see from the top left and right pictures, this is the screen that was shown throughout the game we played. So much fun! The top left and right pictures include different jerseys and photographs of well known players. 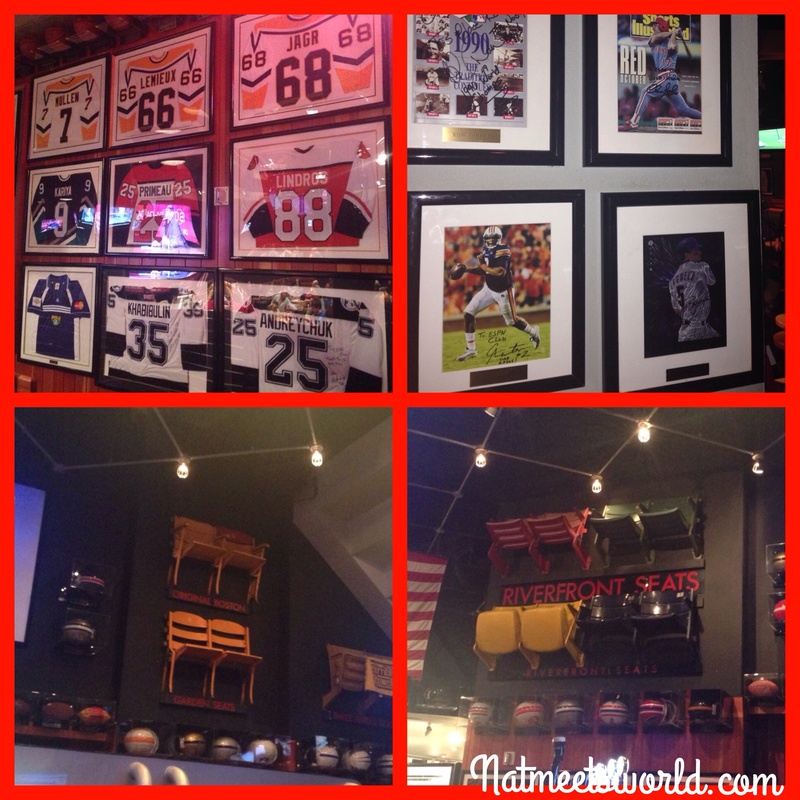 The bottom left and right picture include the actual chairs from Fenway Park and Riverside Stadium. Too cool! Another aspect I loved are the restrooms! Don’t worry about having to miss an important play during the game…there is a television and live audio playing while you go! Also, if you are in town for a major basketball, football, or baseball game, be sure to watch it live here at the ESPN Club. Lastly, not only is the atmosphere inside the restaurant great, the exterior is just as wonderful. Below is a picture of the Boardwalk, which is the view that is visible from the entrance/exit of the ESPN Club restaurant. Due to my immediate draw into the trivia game, the waitress whisked away the menu before I could take a picture. 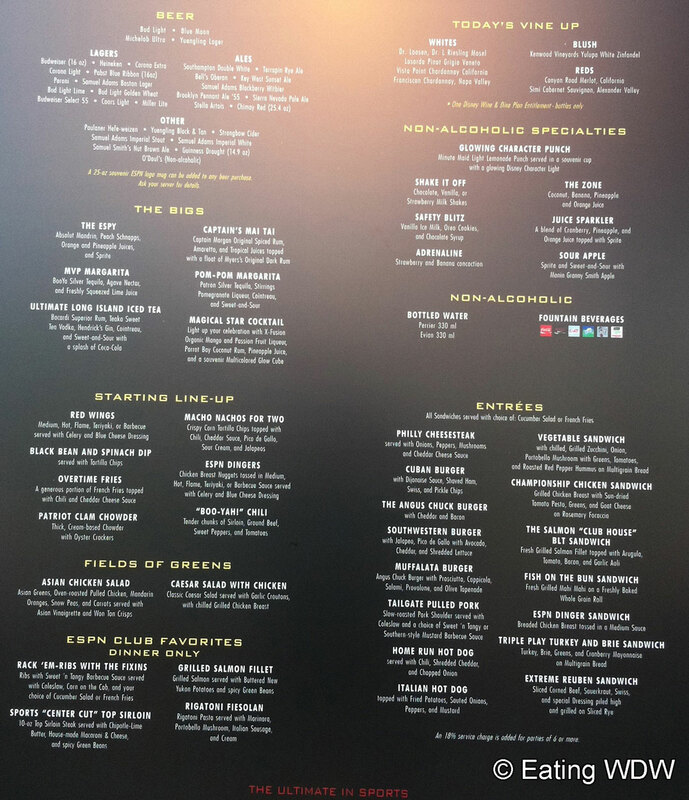 This menu (taken by eatingwdw.com) includes all of the food that is offered at the ESPN Club. I would describe it as typical ale house dining options. The menu is cleverly labeled with sports terms for each section. For example, the ‘Warm Ups’ is the title for the soups and the ‘Starting Lineup” is the title for the appetizers. We started with our favorite, BBQ wings. They were very large and full of flavor! Then, we shared a bacon cheeseburger which came with steak fries. Don’t let the picture fool you. The burger was large, and this was just my half. 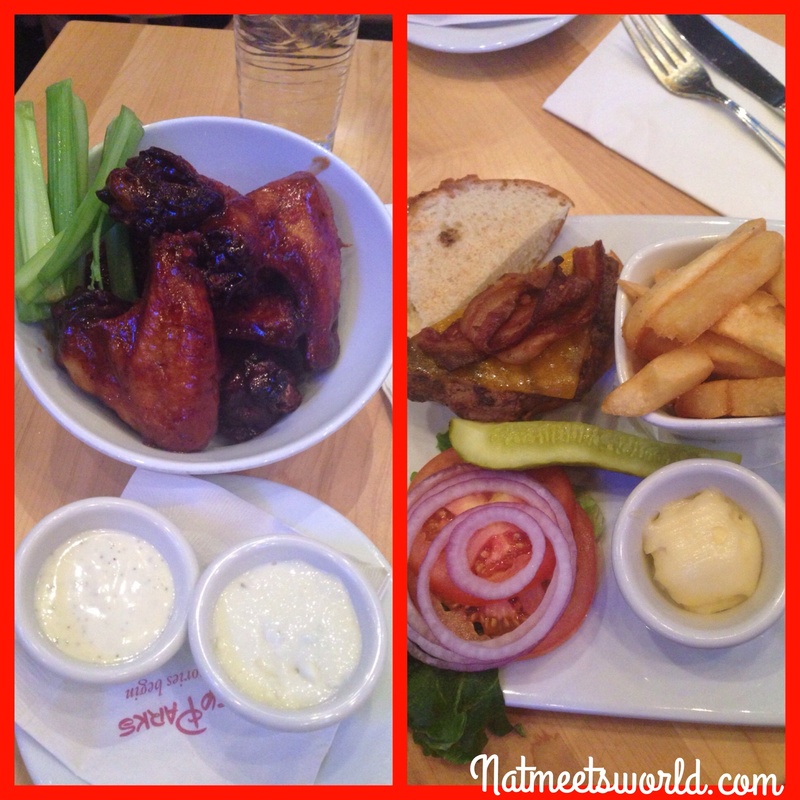 Left: BBQ wings with creamy ranch and blue cheese; Right: bacon cheeseburger with steak fries. 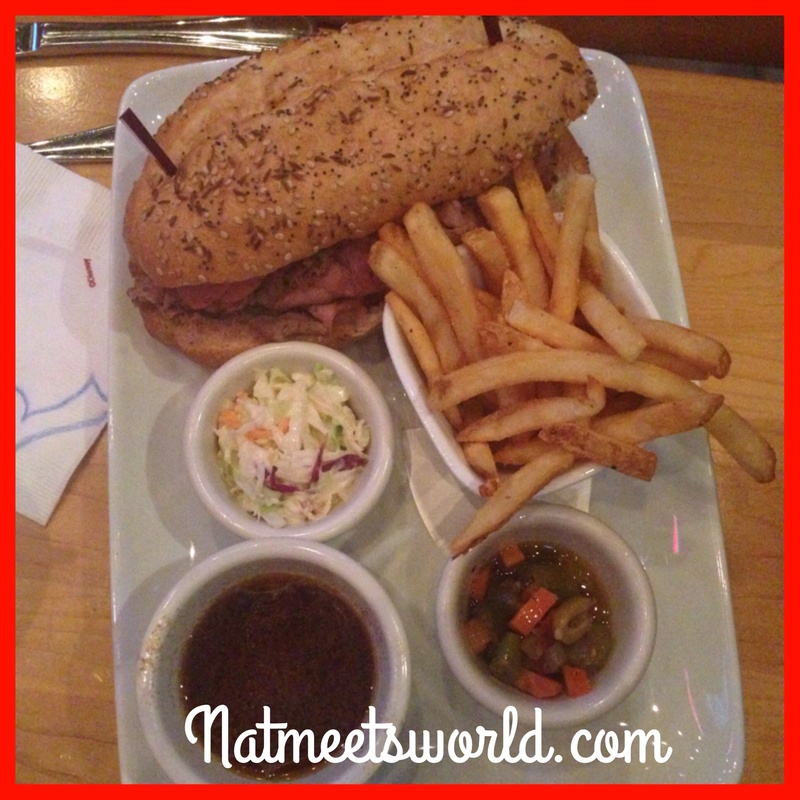 Overall, I was very pleased with our choices, and was completely satisfied after finishing my meal. I have tried other options on the menu here and they have never disappointed me. If you love nachos, I would recommend the loaded nachos on the appetizer menu. The attention to detail is evident in the way they tailored this venue to meet the needs of all sports lovers. I have returned to the ESPN Club restaurant this week, and tried some different food choices that were out of this world. 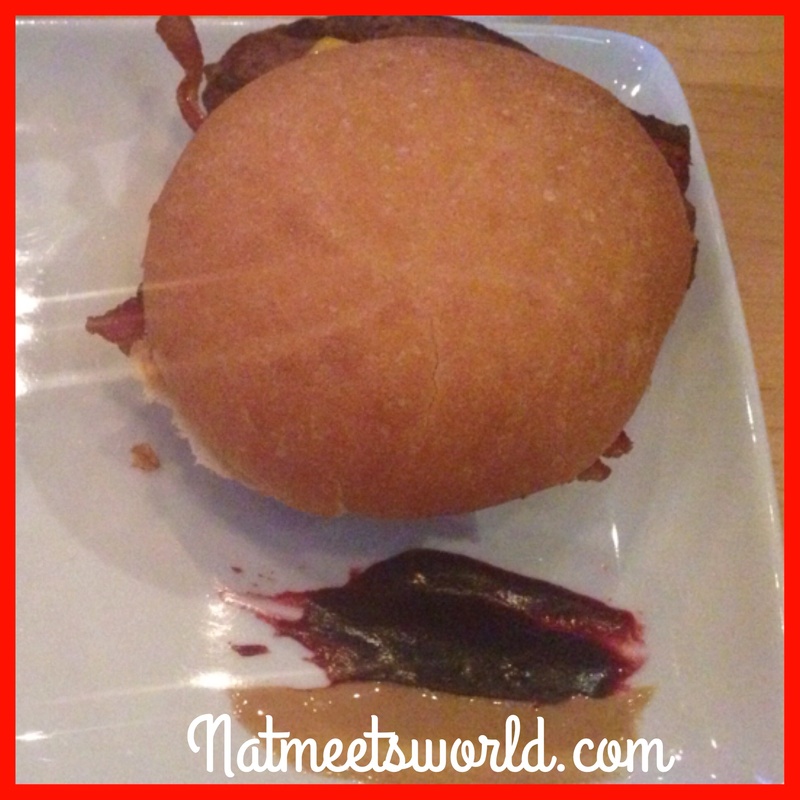 ESPN has a unique burger called (drumroll, please)……..a PB&J burger. Yes, you read that correctly. 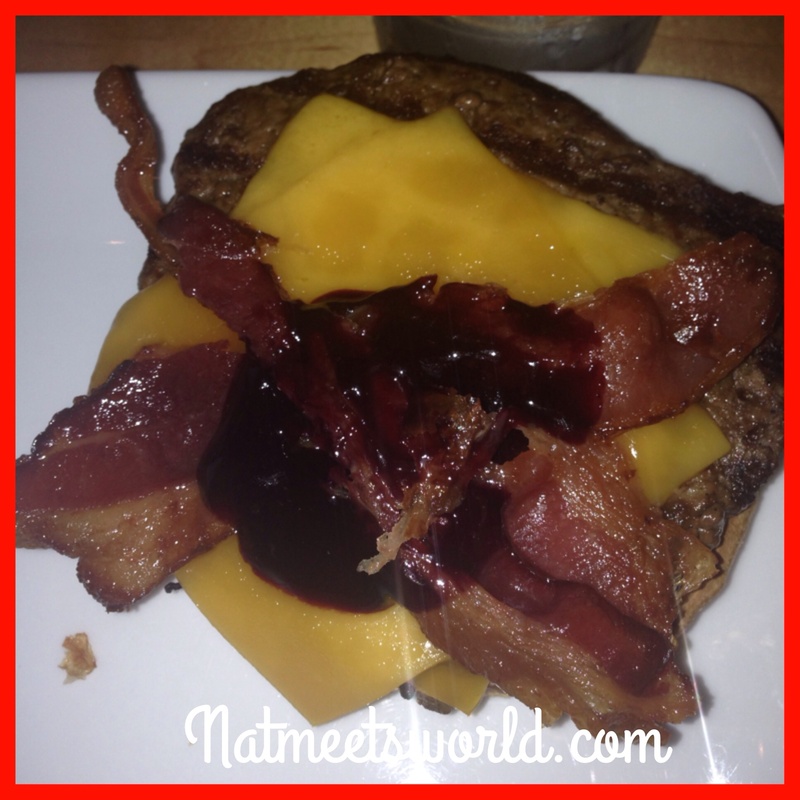 This burger is loaded with cheese, bacon, jalapenos, and peanut butter and jelly. At first, I was hesitant to try it, but boy am I glad I did! This unique burger is a MUST at the ESPN! Outside of the PB&J burger. Fries not pictured. My goof friend also enjoyed her dish very much. 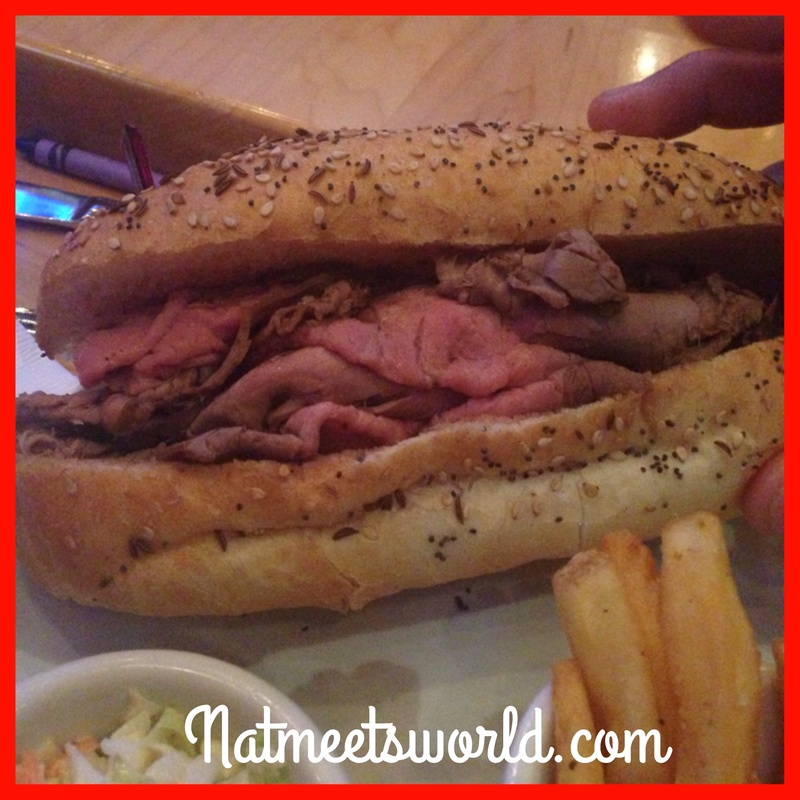 She opted for the upper deck hot roast beef and cheese sandwich. This restaurant is classified as $-(14.99 or less per adult). Kids menus are available as well. Deal Alert: This restaurant accepts the Disney Dining plan and Tables in Wonderland. Annual Pass holders also receive an additional 10% off when showing your pass to your server. 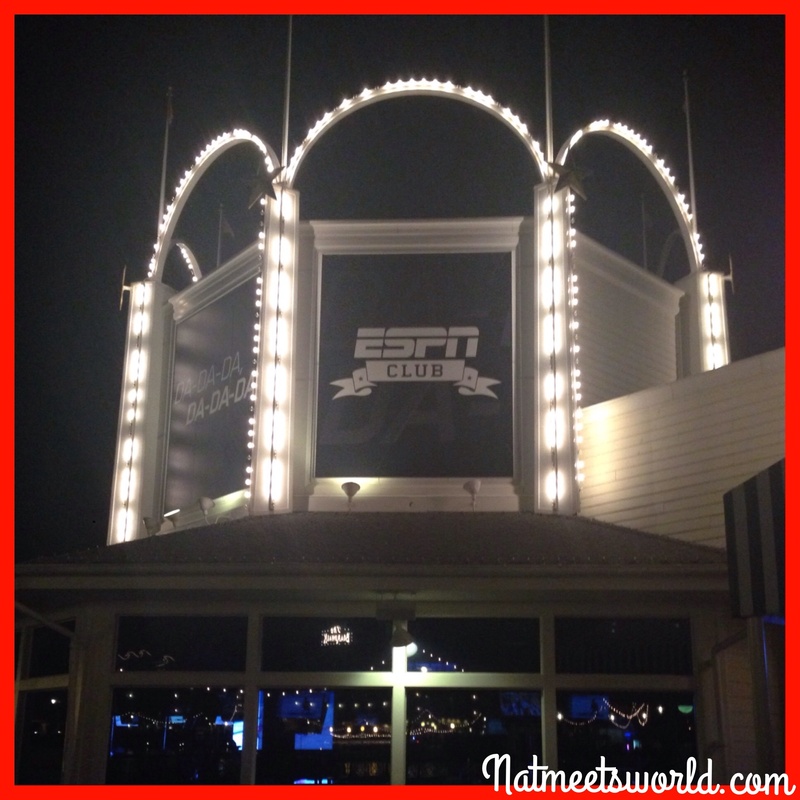 Have you checked out the ESPN Club at Disney’s Boardwalk? What did you think? Comment below! Disclosure: All photos (except menu) and opinions are my own.